My million dollar investment portfolio is within reach! I can almost taste it. Depending on which way the markets will swing over the next few months, I may or may not hit the mark this year. My overall investment portfolio represents my dividend stock portfolio and the retirement contribution plan I have. Here is a quick snapshot from my dividend portfolio tracker after 10 years of data. If you don’t have the performance details of your entire portfolio, take some time to make sure you track it. I have found that most software focuses on accounting tracking and not performance tracking and I got set up to do both based on what I consider profit from an investment. It’s a subtle change in how to calculate your rate of return once you adjust your thinking. Please note that the portfolio is a growth portfolio with many low yield stock holdings. A portfolio focused on income to raise the yield closer to 4% would have different holdings and the annual ROR would drop around 5%. It’s also a mixed portfolio of 50% Canadian holdings and 50% US holdings with a focus on what I consider Dividend Ambassadors. July saw a few activities in that I completely sold my position in Coca-Cola NYSE:KO. Yes, you read correctly, I am no more a stockholder of Coca-Cola. I wasn’t losing money but it was not keeping up with my portfolio expectations for growth in my accumulation years. I would gladly own it again in my income years for the yield and safety. I used the proceeds from KO to increase my position in 3M NYSE:MMM. 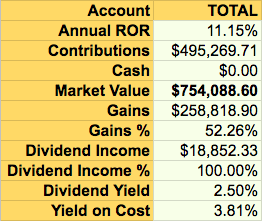 Since I get set up to track my individual stock performance to generate an annual rate of return (ROR), it really helps to see which of my holdings is really working for me. It’s one thing to have a stock up 50% after 2 years, it’s another to have a stock up 50% after 7 years. If you know the Rule of 72, you can quickly assess that the 50% after 7 years is just over 5% annually whereas 100% after 7 years would yield a 10% annual return. My top Canadian performing stock is currently TD Bank TSE:TD with 24.03% annual ROR. My best US performing stock is Costco NYSE:COST with 39.20%. Healthcare has been pulling back this year and there is the Amazon effect on drug distribution as well. Once I have new money to add, I will look into the top 3 sectors that are behind and find the best opportunity to invest in. What makes diversification challenging for me these days is that some of my accounts have reached the limit in contribution for the year. It’s not possible to simply add money and I would need to sell. My July 2018 dividend income is $1,753.89. It’s my highest dividend income month EVER! I hold a fair amount with the Canadian banks and July is the quarter when the banks pay up.